(2015-08-03, 16:08)J_E_F_F Wrote: I am in that group. Can't boot while overclocked on one of my RPi2 units. The other RPi2 boots fine overclocked. Odd. rename to start.elf and fixup.dat and replace ones on boot partition of your sdcard. See if that fixes the overclock related crash on boot. Great. That's one of the unexplained issues crossed off. Looks like I spoke too soon. It did not survive a 2nd, 3rd, 4th reboot. Hung each time just displaying the build number. and older builds are rebooting multiple times without problems? (2015-08-03, 16:43)J_E_F_F Wrote: Looks like I spoke too soon. It did not survive a 2nd, 3rd, 4th reboot. Hung each time just displaying the build number. Does reducing the overclock a little avoid the hang? Does reverting the firmware back produce the panic again? 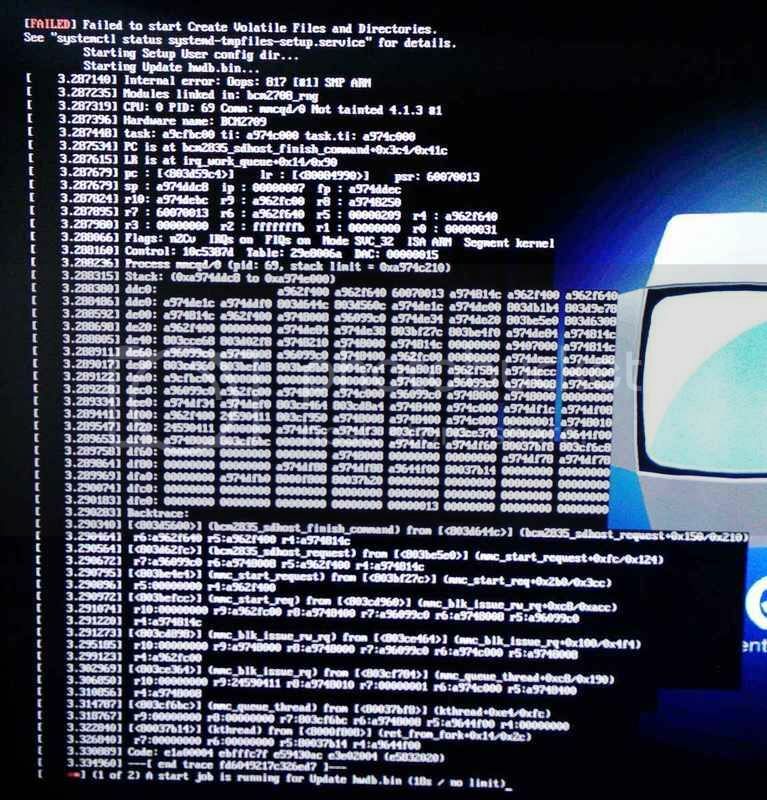 Note: there is a bug in last night's build that can crash Kodi when displaying the splash screen. I'm not sure if you can be hitting that (I saw it restart kodi a few times before setting, but possibly there are other ways it can fail). Perhaps revert to preiovious build and then update firmware. (2015-08-03, 16:58)L-S-D Wrote: and older builds are rebooting multiple times without problems? That is what appears to be causing my problem. Odd, that I have 2 RPi2s both same build, both same microSD card, one has problem, the other does not. (2015-08-03, 17:02)popcornmix Wrote: But no panic now? We posted at the same time, so you may have missed the latest screenshot. Take a look just above. (2015-08-03, 16:44)wchick132 Wrote: gpu_mem set to 256MB, What value should I use? Please note I didn't change my config file, I simply used the OpenELEC RPi Config add-on to change the setting. Try 512 just to be sure. Unlikely to actually need that much, but if the problem still exists then we know it's not gpu_mem related. The maximum gpu_mem that I could set with OpenELEC RPi Config add-on is 448MB. Set it to this value and reboot, x265/HEVC video with external subtitle file ran into freeze-pixelation-recovery sequence as before. With another x265/HEVC video file (same TV episode) but with embedded subtitle, also exhibit the same problem. However, when I turned the subtitle display off, it plays flawlessly so far (more than 15 minutes). It seems increase the value of gpu_mem didn't help. (2015-08-03, 17:20)wchick132 Wrote: The maximum gpu_mem that I could set with OpenELEC RPi Config add-on is 448MB. Set it to this value and reboot, x265/HEVC video with external subtitle file ran into freeze-pixelation-recovery sequence as before. With another x265/HEVC video file (same TV episode) but with embedded subtitle, also exhibit the same problem. However, when I turned the subtitle display off, it plays flawlessly so far (more than 15 minutes). Can you provide an external subtitle file that is known to cause issues? I did play a hevc file through a few times without issue at weekend, but there ware no subtitles. (2015-08-03, 16:13)Kiralina Wrote: With the latest build the image is frozen on RP2. I tried it with and without overclocking. Back to #0725. I have these image freezing problems with all the newer builds. More details please. Was #0725 the first build with the problem? Does it occur with sync plackback to display on/off. Does it apply to all files? What is container/codec of a problematic file? -sync playback to display is on. -it applies to all online content from add-ons as istream, genesis, phoenix, etc. With the latest 5 builds when I hit play video, it starts the video, but the first movie image remains frozen while I hear the dialogs in the background. If I downgrade to #0725 all works fine. Maybe 0726 or 0727 would also work. I didn't try them. I jumped from #0725 to #0729c, 0730, 0731,0801 and 0802 and had this problem with all 5 newer builds. Overclocked or not, it's all the same. -it applies to all online content from add-ons as istream, genesis, phoenix, etc. With the latest 5 builds when I hit play video, it starts the video, but the first movie image remains frozen while I hear the dialogs in the background. If I downgrade to #0725 all works fine. Maybe 0726 or 0727 would also work. I didn't try them. I jumped from #0725 to #0729c, 0730, 0731,0801 and 0802 and had this problem with all 5 newer builds. Would be useful if you can confirm the exact build that introduced the problem. My uplink speed is very slow and I'm not familiar so it would take some time. It's not a specific subtitle file. I download all my subtitle files from http://www.addic7ed.com, rename it so that it's the same with x265/HEVC video file but with .srt extension. If you don't want to wait, you can download whatever subtitle, rename it to the name of your video and test. (2015-08-03, 17:44)wchick132 Wrote: It's not a specific subtitle file. I download all my subtitle files from http://www.addic7ed.com, rename it so that it's the same with x265/HEVC video file but with .srt extension. If you don't want to wait, you can download whatever subtitle, rename it to the name of your video and test. Can you point to the url (on addic7ed.com) of a specific file you have seen a problem with, and I'll download from there. It looks like the new libnfs may have introduced a problem in #0802. I just had a SEGV.